The festival celebrates cats of legend and lore, cats in history, and cats around the world. It has been a long journey for the festival to go from hate and fear to love and adoration. As all cat lovers and ancient Egyptians know, adoration is the way to go. The centerpiece of the festival is the Cat Parade. 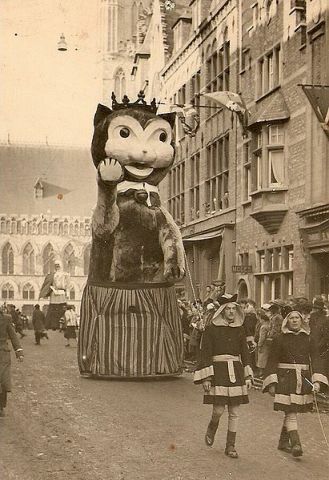 The first parade was held in 1938 with music, a jester, and a bunch of altar boys carrying a bunch of plastic cats. They marched from the city hall to the belfry. Amid a concert of trumpet music and the carillon of bells, the jester climbed to the top of the belfry tower to throw the toy cats into the crowd below. This was based on how live cats were once thrown from the bell tower during the Middle Ages. These days it is soft plush cats that are tossed to the crowd below, perhaps mocking the awful brutality that is now thankfully left to the past. A mock witch burning also remains as a part of the festivities. 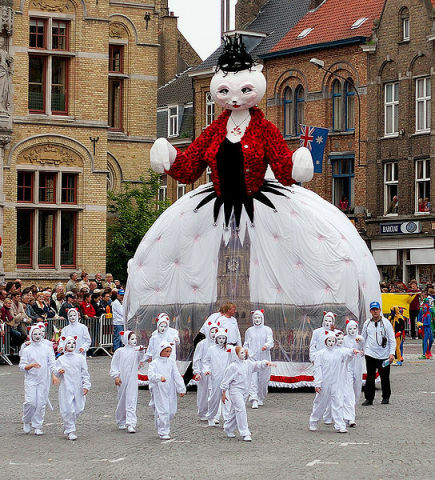 The parade was suspended during the years of World War II when the city of Ypres was all but leveled by the fighting, but resumed again in 1946. It became a full-fledged event in the 1950s as it grew to include 1500 people. The reasons for expanding the parade include the rebuilding of the city and creating tourism to help create a new economy for the area. 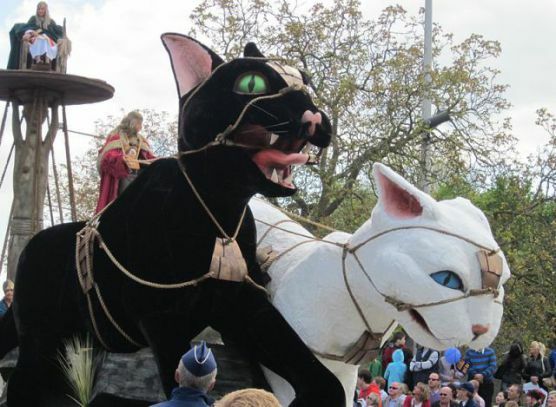 The parade now boasts bands, marchers and dancers dressed as cats and mice, and giant cat effigies. They march through the town watched by large crowds of people, both locals and tourists, who turn out to cheer on the cats. No live cats are used in the Festival. If you want to attend the next Cat Festival you can start planning now. The next one will be held on May 10, 2015.